If revitalization, creativity and low real estate tickets are up your alley, East Austin might be the place for you. Located between IH-35, Springdale Road, Lady Bird Lake and Manor Road, East Austin is a highly distinctive, and increasingly talked about neighborhood. With a sometimes unsettling past of being on the wrong side of the tracks—or highway—East Austin has struggled to compete with surrounding areas. Until now. As a newly developing up-and-comer, East Austin is full of creatives, and offers an eclectic mix of homes circa 1930 to 1950 next door to several new constructions. Housing prices also range, but are much more affordable than most other markets in Central Austin. This year averaged near $225,000 for a single-family home. Though curb appeal changes from block to block, the rapidly increasing interest in East Austin and influx of new residents keeps this area on the map—and top of mind for many young new Austin implants. Some of the more sought after streets include blocks near the Manor, 11th and 6th street, and the French Place area. 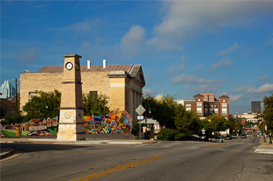 East Austin schools lie within the Austin Independent School District. There are also several private school options—Cathedral School of St. Mary, Redeemer City School, The Khabele School, St. Austin Catholic School and Concordia Academy. East Austin is growing daily, and with that growth keeps coming new business. Restaurants and bars, art galleries and unique shops just keep popping up among the already established hotspots. When it comes to the grub, longstanding neighborhood favorites like Hoover’s Home Cooking, the Eastside Café and Sam’s BBQ have bolstered the streets of East Austin for years. And, with newcomers such as Papi Tinos, Blue Dahlia, Takoba and El Chile prospects are only looking better. And, it’s not just the food scene that’s expanding. Groups like Salvage Vanguard and Rude Mechanicals, and local small business owners maintain upkeep on venues and watering holes alike. Head to Cheer Up Charlie’s for a beer, a smile and a local dive feel. Or, stop in to Gypsy for great live music or a poetry reading. Or, head to The White Horse for a throw back, Western rockabilly kind of night. For day trips, visit some of the largest landlords in the area at their art galleries. Many have an open door policy, but for those who typically don’t, get a behind the scenes view during the East Austin Studio Tour. The event increases foot and bike traffic, calling the nature trail riders of Lady Bird Lake to the pavement, and the cellar dwellers out into the light. And, always keep your ears perked for the newest Austin hit—it will probably show up here.